Mick Smith and I wrote this paper for for IIEMCA. I’ll upload the full video of the talk once it’s done. Here are the references for now as they won’t fit on a slide. We focus on some practices people use to formulate a setting as available for use in interaction: as resources that recipients may optionally ratify and accomplish as resources in and through social action. Co-participants can formulate objects that they may then re-use, expand and re-transform in subsequent talk. We explore this process by analyzing the work of senior and novice field geologists conducting fieldwork while walking through a wilderness setting. We show how participants use noticings as methods to develop and share candidate understandings of the world around them: as analyzable, knowable, and actionable phenomena. We trace the procedures through which participants produce copresent occasioned noticings that combine their engagement with each other and with their co-present setting into mutually accountable joint activities. We argue that for a noticeable to become useful as an actionable resource, co-participants must first analyze its relevance to whatever activity is currently underway. This members’ analysis provides a key resource for participants and analysts alike by revealing how ‘what-we’re-doing now’ is embedded within larger activities and projects, allowing what might otherwise remain incohate and unnoticed to become an inferentially rich resource for participants in the conduct of situated activities. Couper-Kuhlen, Elizabeth. 2010. “Commentary on Stivers and Rossano: Mobilizing Response.” Research on Language & Social Interaction 43 (1). Informa UK Limited: 32–37. doi:10.1080/08351810903471316. Goodwin, Charles, and Marjorie Harness Goodwin. 2012. “Car Talk: Integrating Texts, Bodies, and Changing Landscapes.” Semiotica 191 (1/4): 257–86. doi:10.1515/sem-2012-0063. Halkowski, T. 2006. “Realizing the Illness: Patients’ Narratives of Symptom Discovery.” In Communication in Medical Care Interaction between Primary Care Physicians and Patients, edited by John Heritage and Douglas W. Maynard. Vol. 20. Studies in Interactional Sociolinguistics. Cambridge University Press. doi:10.1017/CBO9780511607172.006. Hoey, Elliott M. 2015. “Lapses: How People Arrive at and Deal With, Discontinuities in Talk.” Research on Language and Social Interaction 48 (4). Informa UK Limited: 430–53. doi:10.1080/08351813.2015.1090116. Keisanen, Tiina. 2012. “Uh-Oh, We Were Going There: Environmentally Occasioned Noticings of Trouble in in-Car Interaction.” Semiotica 191 (1/4): 197–222. doi:10.1515/sem-2012-0061. Koschmann, Timothy, and Alan Zemel. 2009. “Optical Pulsars and Black Arrows: Discoveries as Occasioned Productions.” Journal of the Learning Sciences 18 (2). Informa UK Limited: 200–246. doi:10.1080/10508400902797966. Schegloff, Emanuel A. 2007. Sequence Organization in Interaction: Volume 1: A Primer in Conversation Analysis. Cambridge: Cambridge University Press. Schegloff, Emanuel A. 2010. “Commentary on Stivers and Rossano: Mobilizing Response.” Research on Language and Social Interaction 43 (1): 38–48. doi:10.1080/08351810903471282. Sidnell, Jack. 2012. “Declaratives Questioning, Defeasibility.” Research on Language & Social Interaction 45 (1). Informa UK Limited: 53–60. doi:10.1080/08351813.2012.646686. Stivers, Tanya, and Federico Rossano. 2010. “Mobilizing Response.” Research on Language & Social Interaction 43 (1): 3–31. doi:10.1080/08351810903471258. Stivers, Tanya. 2015. “Coding Social Interaction: A Heretical Approach in Conversation Analysis?.” Research on Language and Social Interaction 48 (1). Informa UK Limited: 1–19. doi:10.1080/08351813.2015.993837. Sacks, Harvey. 1995. Lectures on Conversation. Edited by Gail Jefferson. Vol. I. London: Wiley-Blackwell. In 2015 I wrote a quick introduction to CA for people who study the psychology of interaction and discourse (still in press). I’ve used that as the basis of this longish post for people who need some starting points in #EM/CA. Also check the EMCA wiki for new references (there are more all the time – it’s a flourishing field). 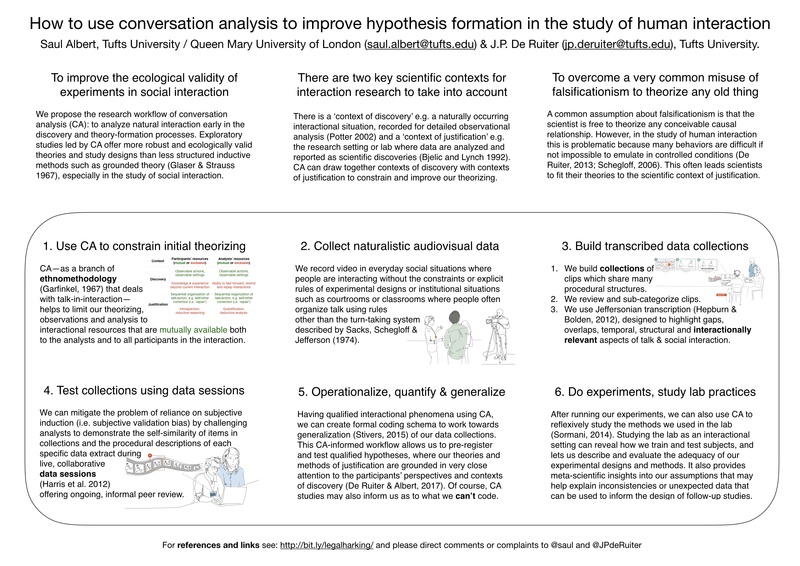 Conversation Analysis (CA) is an interdisciplinary, inductive approach to studying talk and interaction ‘in the wild’ and in situations where the formal parameters, theories and models for interaction are unknown, premature, or where theories are currently undergoing revision. So what is CA useful for? What kinds of questions can one ask with it? And what kinds of answers can be gleaned at different points in the research cycle? CA is especially useful for empirical research on interaction in naturalistic settings where established theories may be lacking or under revision. This is because CA looks for detailed qualitative evidence of how participants work to organise their interactions sequentially in each specific situation. CA relies on a recorded event, utterance or gesture as analytic evidence only when the participants demonstrably use that event to organise their subsequent actions. On the one hand, this forces analysts to limit the generality of the questions they can ask and the claims they can make. For example, studies of interaction in doctor’s offices, courtrooms, or at dinner parties tend to ask questions about how a specific action or utterance is produced in a particular social situation by specific participants. On the other hand, CA’s evidential constraints have led to a methodologically coherent field. By focusing analysis on the methods and events demonstrably used by participants to make sense of their own interactions, CA studies tend to be readily comparable with one another. Although individual studies are situationally specific, analysts can develop and test general findings cumulatively working in diverse settings and fields. Over the last 40 years the most robust and broadly tested finding on which much latter CA research has been based is the turn-taking system described by Sacks, Schegloff, and Jefferson (1974). Without the extended discussion these warrant, the rules of the turn-taking system can be summarised briefly to explain what kind of answers CA can offer. If 1c occurs, the rules are re-applied at the next possible completion. This describes the normative patterns observed in natural conversational turn-taking across contexts in the first decade of CA research. As a finding it provides a framework for further exploratory work in CA, and a strong empirical basis for theory formation for experimentation. As a research outcome, this exemplifies how CA can produce detailed, systematic descriptions from cumulative observations. Alongside these longer-term results, the CA research cycle involves structured observation throughout the process of data gathering, presentation, and collaborative analysis of data within the scope of a single study. Current best practice for CA data gathering involves video of an interactional situation from multiple angles where all participants’ gaze direction, gestures, body orientation, and talk are – ideally – available for analysis. Within relevant practical, social, and ethical constraints, it is useful to record whatever participants evidently pay attention to within the setting including objects, tools, documents, computer, phone, and screen captures. Interaction mediated via text, audio, and video also constitutes viable data, however for a sequential analysis, participants and CA researchers should be able to access the same evidential and temporal contingencies and constraints. For example, phone calls provide ideal data for CA studies because participants and researchers alike can analyse the same audio events in the same order. Because a CA study may focus on very intricate details, a few seconds of a recording can yield data for a ‘single case analysis’, contributing to or questioning cumulative findings. Researchers also re-analyse data from previous studies, use examples from audiovisual corpora and data fragments from the CA literature, often as a foil for discussion. Transcription is central to CA research as it involves repeatedly reviewing the data to build up an initial description that can be checked by others from an early stage. Variations on Gail Jefferson’s transcription conventions1 provide a level of detail that can be adjusted for the specific phenomena in question. Verbal interaction is typed out turn-by-turn, then symbols are added and arranged spatially to indicate temporal and production features of talk. For example, extract 1 depicts Paul and Anne’s talk as their teacher sings a count of eight during a partner dance class. Links to online data are also provided where possible. 7  Tchr:             ⌊six se::ven eight? Reading while listening to the audio should show how Jefferson’s conventions are roughly intuitive : left and right braces show points of overlap, carats show talk speeding up, while colons indicate sound stretches. Because these conventions compromise between precision, detail, and readability there are also some inevitable ambiguities, for example punctuation indicates intonation rather than grammar, and turn-initial capitals mark transcriber hearings of turn-beginnings, but elsewhere they indicate loud talk. The purpose, however, is not analysis of the transcript. Rather transcripts provide a useful sketch to aid in more formal description, and a convenient way for analysts to refer to specific moments of the original video in a data session presentation. In a data session, a researcher presents new data and transcripts for repeated viewings and extended analytical discussion amongst a small group of colleagues. Since CA relies on the linguistic and interactional aptitude of the analyst as an heuristic instrument, regular data sessions provide an essential opportunity to revise transcripts and candidate analyses amongst peers. Details of the present data are discussed in relation to cumulative findings, and the implications of or alternatives to each analysis are proposed and challenged. Ideally, data sessions are both pedagogical and deliberative, where experienced and student analysts refine their observations and descriptions by picking out specific fragments of data, and contextualise findings within the literature. Over time, researchers build ‘collections’ of data fragments such as extract 1: part of a collection of ‘countings’, where people count up or down to coordinate joint actions. A rough collection is a starting point for identifying a distinct social practice as a specifiable analytic phenomenon. Analysis then refines a collection in terms of how participants orient to the sequential organisation of an action, and to its lexical, grammatical, and/or embodied structural features of composition and design (Schegloff 1993, 121). For example, before the video clip of extract 1 starts, Paul and Anne have been evaluating their previous attempt at a dance move. The teacher’s count starts with a loud, stretched “”, a short pause then a rising “”, before both pitch and count re-sets to five and moves back up to a final, rising “”. At the onset of the count, Paul’s turns his head to the teachers and back to Anne, hushing his second “”. Anne also speeds up and softens her talk, turning her head towards the teachers then back to Paul as the count reaches its first “”. Paul’s minimal “” receipts Anne’s assessment just as he briefly turns his head away from her again. Her laugh closes the sequence, and they re-establish mutual gaze as the count enters its final phase. Forgoing more detailed description on the one hand, and the broader sequential context on the other, this fragment provides a simple example of how such data can be presented. The embodied turn (Nevile 2015) in the CA literature has led researchers to add more detail to transcripts of talk, using illustrations (Laurier 2014) to describe gesture and gaze direction as well as diagrammatic representations of, for example pitch tracks and phonological details. Figure illustrates the temporal structure of talk and patterns of other-directed mutual gaze just before Paul and Anne start dancing. In terms of cumulative CA findings, these details could be analysed alongside generalised CA work on how assessments implicate sequence closure in everyday conversation, and how patterns of mutual gaze work towards topic, focus, and activity shifts (Heath 1986, 128–48; Mondada 2006; Rossano 2012, 227–308). In a more applied project, the way the dancers’ turns at talk and gaze shifts match the phase structure of the teacher’s count could be analysed in relation to ongoing research into how bodily-vocal group activities are organised in dance instruction (Keevallik 2014). This fragment may be added to multiple collections including ’embodied closings’ or ‘countings’ as well as specialised sub-collections such as ‘dance closings’ and ‘count-ins’. CA findings are thus developed incrementally by documenting the detail of people’s interactional practices in specific settings while contributing to a general understanding of ‘everyday talk-in-interaction’. This super-set of copresent interactional practices provides a normative basis for researchers studying specialised settings where institutional or practical constraints may constrain interactional practices (Drew and Heritage 1992) Identifying and fully describing a new phenomenon in these terms may therefore require collection of hundreds of cases, but a single case analysis can still test, discuss, or suggest a finding by demonstrating its use in a specific context. CA can also be used in mixed-methods research, especially in theory formation, experimental design, and evaluation processes. CA researchers may discover a systematic variation in participants’ situated action, sometimes as simple as an issue of lexical choice. For example, Heritage et al. (2007) observed that doctors vary the ways they ask about patients’ unmet concerns during consultations. Their experiment asked doctors to request whether their patients had “anything else” or “something else” to talk about, and discovered that 78% fewer unmet concerns were reported in the latter condition. In this way CA’s focus on interactional practices in natural settings provides systematic observations that can help design ecologically sound experimental variables and guide the formulation of falsifiable theories (Robinson and Heritage 2014). In conjunction with more conventional social science methods, CA is useful in similar ways when it foregrounds the participants’ interactional uses of the research setting. For example, CA studies of interviewing practices (Potter and Hepburn 2012) contribute to methodological developments that are starting to incorporate the pragmatics of talk and the practicalities of survey technologies into a broader analysis (Conrad, Schober, and Schwarz 2013). Similarly, studies of methods that use introspective self-report (Wooffitt and Holt 2011) or CA’s own practices of video recording (Hazel 2015) are opening up new opportunities to approach theoretical questions across fields as practical, observable issues based on the endogenous organisation of situated activities. CA’s early focus on everyday talk has both influenced and drawn on the interactional respecification of core questions in linguistics and pragmatics (Ochs, Schegloff, and Thompson 1996; Levinson 1983), and psychology (Edwards and Potter 2001; Tileagă and Stokoe 2015), along with a broader shift in the social sciences towards posing empirical questions in terms of practical action (Button 1991; Lynch 1997). To use CA within a broader scientific context, however, it is necessary to clarify how its findings are descriptive of normative structures in talk rather than predictive or prescriptive, and may be combined with other methods in order to develop and test formal hypotheses (Lynch 2000, 522). This limited introduction is intended to provide only the most basic starting points for researchers wishing to explore CA and get a foothold in its literature. There are now many excellent primers available (Schegloff 2007a; Ten Have, 2007; Hutchby & Wooffitt, 2008; Heath, Hindmarsh, and Luff 2010; Sidnell 2011; Clift, 2016) as well as a more comprehensive handbook (Sidnell & Stivers, 2012) for those who would like to explore CA’s contemporary issues and research questions further. Atkinson, J.M., and John Heritage. 1984. Structures of social action: Studies in conversation analysis. Edited by J. Maxwell Atkinson and John Heritage. Cambridge: Cambridge University Press. Button, Graham. 1991. “Introduction: Ethnomethodology and the Foundational Respecification of the Human Sciences.” In Ethnomethodology and the Human Sciences, edited by Graham Button, 1–9. Cambridge: Cambridge University Press. doi:10.1017/CBO9780511611827.002. Clift, Rebecca. 2016. Conversation Analysis: 1st ed. Cambridge Textbooks in Linguistics. Cambridge: Cambridge University Press. Conrad, Frederick G., Michael F. Schober, and Norbert Schwarz. 2013. “Pragmatic Processes in Survey Interviewing.” Oxford Handbooks Online, December. Oxford University Press. doi:10.1093/oxfordhb/9780199838639.013.005. Drew, Paul, and John Heritage. 1992. Talk at work: Interaction in institutional settings. Cambridge: Cambridge University Press. Edwards, Derek, and Jonathan Potter. 2001. “Discursive Social Psychology.” In The New Handbook of Language and Social Psychology, edited by P Robinson and H Giles, 103–18. London: John Wiley & Sons Ltd.
Have, P Ten. 2007. Doing conversation analysis: A Practical Guide. 2nd ed. London: Sage Publications. Hazel, S. 2015. “The Paradox from Within: Research Participants Doing-Being-Observed.” Qualitative Research, September. SAGE Publications. doi:10.1177/1468794115596216. Heath, Christian. 1986. Body Movement and Speech in Medical Interaction. Cambridge: Cambridge University Press (CUP). doi:10.1017/cbo9780511628221. Heath, Christian, Jon Hindmarsh, and Paul Luff. 2010. Video in Qualitative Research Analysing Social Interaction in Everyday Life. Introducing Qualitative Methods. London: Sage Publications. Heritage, John, Jeffrey D. Robinson, Marc N Elliott, Megan Beckett, and Michael Wilkes. 2007. “Reducing patients’ unmet concerns in primary care: the difference one word can make.” Journal of General Internal Medicine 22 (10): 1429–33. doi:10.1007/s11606-007-0279-0. Hutchby, Ian, and Robin Wooffitt. 2008. Conversation Analysis. 2nd Edition. Chichester, U.K.: Polity Press. Keevallik, Leelo. 2014. “Turn Organization and Bodily-Vocal Demonstrations.” Journal of Pragmatics 65. Elsevier: 103–20. doi:10.1016/j.pragma.2014.01.008. Laurier, Eric. 2014. “The graphic transcript: Poaching comic book grammar for inscribing the visual, spatial and temporal aspects of action.” Geography Compass 8 (4): 235–48. doi:10.1111/gec3.12123. Lynch, Michael. 1997. Scientific practice and ordinary action: Ethnomethodology and social studies of science. Cambridge: Cambridge University Press. ———. 2000. “The ethnomethodological foundations of conversation analysis.” Text – Interdisciplinary Journal for the Study of Discourse 20 (4): 517–32. doi:10.1515/text.1.2000.20.4.517. Mondada, Lorenza. 2006. “Participants’ Online Analysis and Multimodal Practices: Projecting the End of the Turn and the Closing of the Sequence.” Discourse Studies 8 (1). SAGE Publications: 117–29. doi:10.1177/1461445606059561. Nevile, Maurice. 2015. “The Embodied Turn in Research on Language and Social Interaction.” Research on Language and Social Interaction 48 (2): 121–51. doi:10.1080/08351813.2015.1025499. Ochs, E, Emanuel A Schegloff, and Sandra A Thompson. 1996. Interaction and grammar. Edited by Elinor Ochs, Emanuel A Schegloff, and Sandra A Thompson. 13. Cambridge: Cambridge University Press. Potter, Jonathan, and Alexa Hepburn. 2012. “Eight Challenges for Interview Researchers.” In The SAGE Handbook of Interview Research: The Complexity of the Craft, edited by Jaber F. Gubrium, James A. Holstein, Amir B. Marvasti, and Karyn D. McKinney, 1st ed., 555–71. SAGE Publications, Inc. doi:10.4135/9781452218403. Robinson, Jeffrey D., and John Heritage. 2014. “Intervening With Conversation Analysis: The Case of Medicine.” Research on Language and Social Interaction 47 (3): 201–18. Rossano, Federico. 2012. “Gaze behavior in face-to-face interaction.” PhD thesis, Radboud Universitet Nijmegen. Sacks, Harvey, Emanuel A Schegloff, and Gail Jefferson. 1974. “A simplest systematics for the organization of turn-taking for conversation.” Language 50 (4): 696–735. doi:10.2307/412243. Schegloff, Emanuel A. 1993. “Reflections on Quantification in the Study of Conversation.” Research on Language & Social Interaction 26 (1): 99–128. doi:10.1207/s15327973rlsi2601_5. Sidnell, Jack. 2010. Conversation Analysis: An Introduction. Oxford: Wiley-Blackwell. Sidnell, Jack., and Stivers, Tanya. (Eds). 2012. The Handbook of Conversation Analysis. London: Wiley-Blackwell. Tileagă, Cristian, and Elizabeth Stokoe. 2015. Discursive Psychology: Classic and Contemporary Issues. London: Routledge. Wooffitt, Robin, and Nicola Holt. 2011. Looking In and Speaking Out. Exeter: Imprint Academic. 1See the basic transcription conventions on Prof. Charles Antaki’s CA tutorial website: http://homepages.lboro.ac.uk/~ssca1/notation.htm or the comprehensive account in Atkinson & Heritage (1984, ix–xvi).